Volume number two in our 2018 USF Football Highlights Series brings you a USF standout nicknamed 'Husky' who hails from Niceville High: Tyre McCants! We are proud to present the second edition in our third annual SoFloBulls.com USF Football Highlights Series as Bulls’ beast and wide receiver staple #Ocho Tyre ‘Husky’ McCants (@t_mccants8 ⨳ @T_McCants8) prepares for the 2019 NFL Draft. Our #Ocho highlight reel is a custom reel of hand selected plays from the 2018 season that flaunts McCants’ dynamic athletic prowess. In our opinion, Tyre is going to make a splash at the next level. Or…. 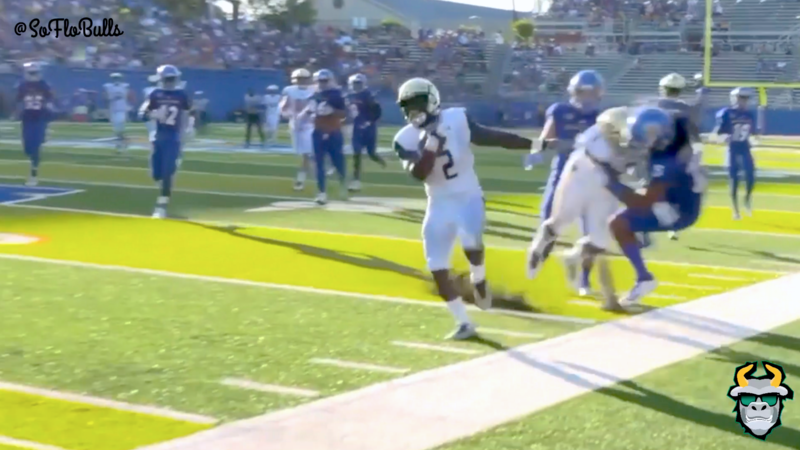 when McCants de-cleated this San Jose State player to spring D’Ernest Johnson for a 50 yard touchdown in 2017…😱🥵!! McCants capped off his illustrious Bowl Game career, finishing as the Bulls career bowl game receptions leader (14), receiving yards (213) and touchdowns (2) during his four bowl game appearances. The 850 native even flicked an absolute dime to WR Randall St. Felix for a touchdown in the Bad Boy Mowers Gasparilla Bowl in his final game. The all-around high school star and 2013 Daily News Large School Player of the Year pulled down seven receptions for 164 yards (23.4 yds./rec. ), scored two touchdowns, and posted 43 kick return yards on just two attempts in 2015. McCants finished his senior season at Niceville with 1,889 total yards and 18 touchdowns. Broken down, McCants rushed for 535 yards and eight touchdowns, added 55 receptions for 798 yards and eight more scores, and posted 556 kick return yards on 14 attempts. McCants’ massive senior year averages out to 40 yards per touch. Yes, 40 yards every single time McCants touched the rock.